Regardless of your age, you can be a historian. In fact, we all are historians. We remember events from the past, share those memories with others, and document history. Here we will locate curriculum ideas, lesson plans, units, field trips, tours, and other research opportunities to engage our students in the Hunts Point Slave Burial Ground Project. Check out available hard copy resources in the PS 48 Hunts Point Slave Burial Ground Learning Center. We are gathering support from the school community to develop curriculum Common Core based materials. The goal of such materials will be providing a framework that allows students to lead the two part quest: a) to definitively determine the location of the burial site through historical text, photographs (thanks MCNY!!! ), and oral accounts; b) and therefore to bring recognition to the lives and deaths, contributions, and role of these slaves in the development of New York through erection of a memorial of some type chosen by student input/research. These curriculum and teaching materials are organized into two major components: Proposed HPSBG Project Flow and Curriculum Ideas Organized By Subject Area. *Please note: Educators should conduct lessons as pertains to their interests in the project. One does not need to teach lessons from all major themes of the curriculum, as listed in the project flow. *The goal is for us to collaborate. Locate lesson ideas below in the 5 major themes that truly pique your interest. Devise a lesson, as formally or informally as you are able to, and create a link on this page to another page that list the lesson plan idea. Please contact us for assistance in placing the curriculum idea on this website or if your would like to start your own project. This section organizes the Hunts Point Slave Burial Ground project from the beginning through completion and beyond. As envisioned, there are 5 major themes to the curriculum. Note: you can use lessons developed by the New York State Social Studies Core Curriculum or K-12 Social Studies Framework as a model for our local curriculum. The National Archives has resources for using primary sources in the classroom, including tips on introducing documents to students and graphic organizers for assisting students in learning information from the documents. These can be used to aid lesson development. 1. Getting to Know the Area Resources to learn about the geographical, economic, and societal history of Hunts Point, The Bronx, New York. By understanding the history of the location, one will more effectively interpret the contextual basis and purpose for the Hunts Point Slave Burial Project. Using modern street names to learn about the past. View a sample student end product. What did Hunts Point look like? Why is it called Hunts Point? How has Hunts Point changed over time? Geographical, economically, development from rural to urban, etc. Calculate and measure the area of the cemetery grounds. Credit: Ms. Allison Grabe, educator at PS 48. Create a map as a census that marks the location of the Drake cemetery tombstone, including coordinates, photograph(s), and information on the individual buried (if known). This can be a paper map and/or interactive online map. Conduct interviews with individuals who lived in the Hunts Point area prior to today to understand change over time. Prepare interview questions, conduct the interview, and devise a format for presenting the information to an audience. Utilize walking trip 'in the field' experiences. See this article for information on the usefulness of field trips. Credit: Ms. Erin O'Neill, educator at PS 48. 2. Remembering the Lives and LegacyResources to learn about the people buried in the slave burial grounds. By understanding the value and contributions of the individuals laid to rest one the burial grounds, one will deepen the contextual knowledge regarding the research location and develop a connection to Hunts Point Slave Burial Project. Develop a movie that details the life of an individual buried in the slave burial ground. Include images and texts relevant to the time frame in which the individual lived. Analyzing historical records to learn information about the individuals and their contributions to the development of New York City. What is the purpose of a cemetery? What is a slave? What is a slave burial ground? Everyone deserves to be remembered. 3. Discovering the Burial Site Resources to learn about utilizing historical records, including texts, maps, articles, and scholarly journals. By understanding how to access historical records, interpret the information and context surrounding historical records, and make discoveries through the use of historical records. Learn how to write a scholarly argument that will lead to a concussion (this is where the burial site is located). 4. Commemorating the LegacyResources to learn how to effectively advocate and educate the community about the history and sacred ground below Hunts Point. The purpose is to write the forgotten back into history by petitioning local, state, and national leaders to provide commemoration through the erection of a historical marker and commemorative plaque. Engaging your friends and community. Click here. 5. Preserving the Site Resources to assist in the preservation of the burial site. The vision is for the P.S. 48 and Hunts Point community to maintain the grounds of the burial site. The civic-minded volunteerism will deepen the community's pride in its historical importance. This will include the maintenance of the Joseph Rodman Drake Park, in collaboration with the New York City Department of Parks and Recreation. Conduct annual or Semi-annual Park and burial site clean up projects with one or more classes. Examples include: garbage pick up, painting, and other activities that will assist a partnership with the New York City Department of Parks and Recreation. Host and/or participate in beautification projects with one or more classes. Examples include planting flowers, removing plant debris, and other activities that will assist a partnership with the New York City Department of Parks and Recreation. Developing a community based outreach program with one or more classes. Examples include creating a historical brochure, a movie, or presentation that students can present to members of interested community organizations, both locally and afar to preserve and commemorate the Hunts Point Slave Burial Project and burial site. See an historic example to use as a model here. Writing a persuasive essay on why we should keep the grounds clean and remembered. Credit: Ms. Allison Doman, educator at PS 48. Utilize some of the following technologies and/or programs in developing final tasks with students. Pretty cool ways to make student work more engaging and approachable by a general audience, as well as developing students' use of technology. How could you use one of these, or another technology, with HPSBG? Youblisher: a way to publish handwritten projects on the Internet as a digital book with flippable pages. See examples here. Take a Time Machine into Hunts Point History: Who will you talk to? What will you ask? What will you find out? What will be your perspective about Hunts Point if you were ___? Enslaved American, Thomas Hunt, Gabriel Legget, etc. Calculate and measure the area of the grounds. Credit: Ms. Allison Grabe, educator at PS 48. 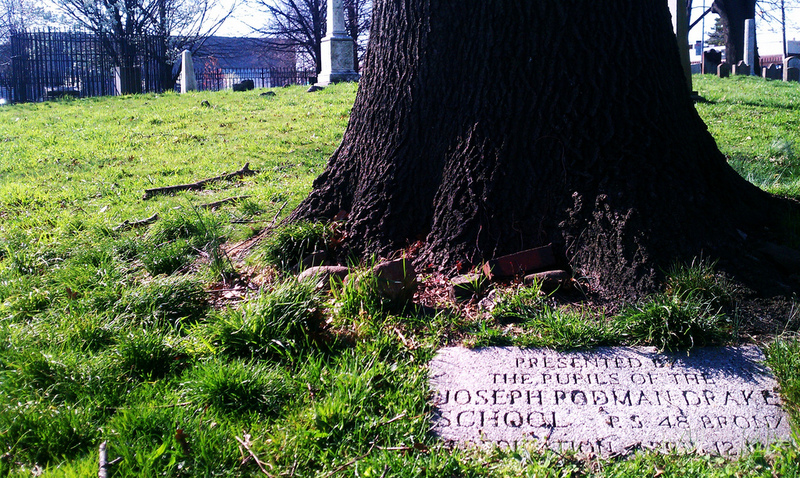 Visit the Joseph Rodman Drake Park. Create a "Press Release" and/or editorials to reach out to Press Contacts. Credit: Ms. Grace Binuya, educator at PS 48. Develop a class newspaper with your class. Who will be the photographer? Etc. Credit: Ms. Grace Binuya, educator at PS 48.